The Gentleman Crafter: Thank Yous, Gifts and Courtyard! Hope your Sunday is going well! Thanks for coming by the Secret Sunday Ustream. We cut out all the Eileen Hull Dies to see what they looked like. So neat! Can't wait to play with them. Thanks Again Eileen! You Rock! 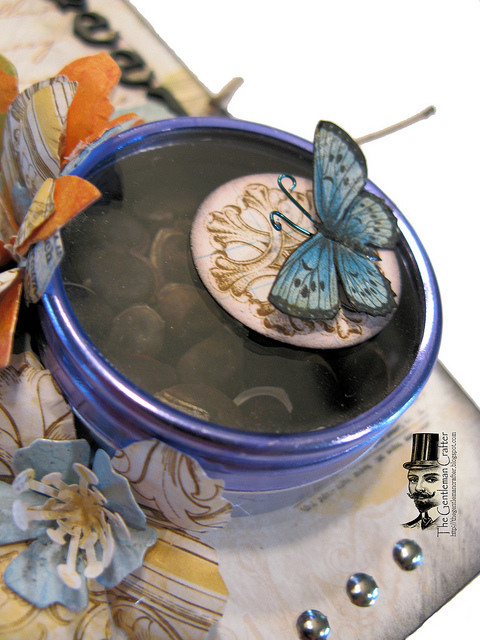 I used the punch on Kraft cardstock and glued three layers of the moustaches together with Glossy Accents to add dimension. 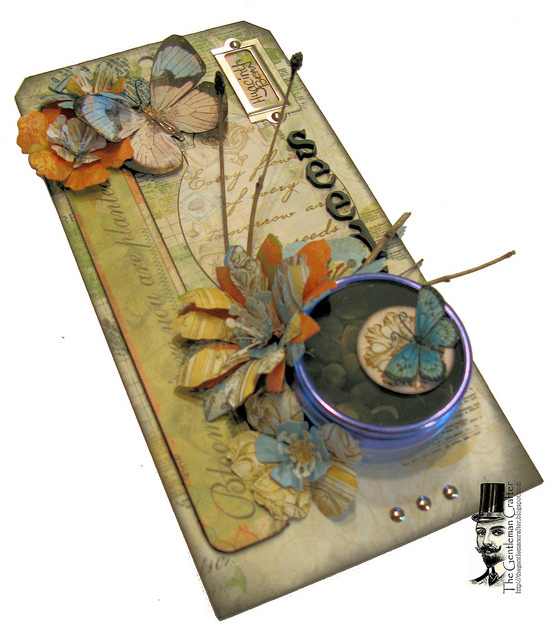 I placed the "staches" around the border of the page, again with Glossy Accents. Next, I applied white gesso to the pages. 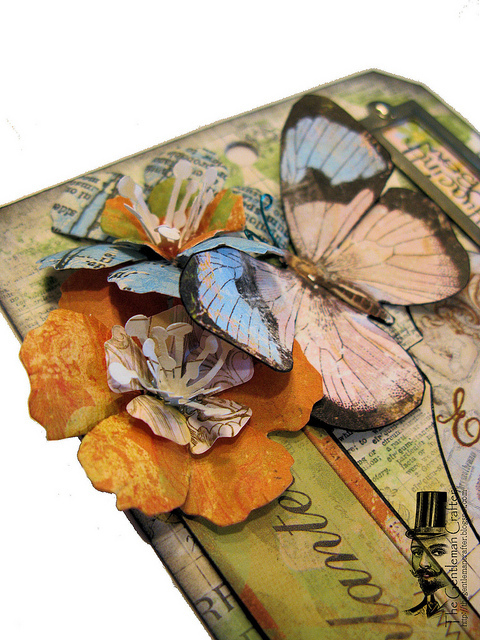 I daubed on Tim Holtz Distress Paint in three colors across the pages, spritzed them with water and then went over them with a paint brush. Once dry, I used a piece of sandpaper to bring out some of the white gesso for a distressed look. I stamped the background with Tim's Fluer de lis stamp from Stampers Anonymous in black Archival Ink. I punched more of the moustaches from dictionary paper and adhered them all over the page. I then stamped out Dyan Reaveley's, Man About Town stamp from her Dylusions Couture Collection onto Ranger Manila cardstock and cut him out. I used the Dylusions inks and painted the gent's clothes. I added a red bow tie and a tiny carnation to his lapel. 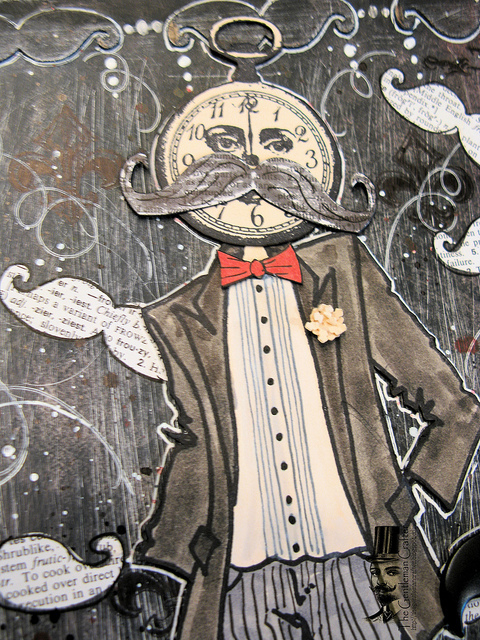 Last, I added the clock face and die cut the moustache and applied it to his face. I applied him to the page. Thanks Barrie so much for the punch! It's awesome! Hope you like it Wanda! Thanks Naomi! Appreciate it! J.
chém gióvây Lê Tiểu Dao ở tại trong đó, đồng thời trong tay một mảnh hơi thở thật lớn đồng thời hướng về phía Nhiễm Ô Thanh mà đi. Nhiễm Ô Thanh sắc mặt đại biến, lập tức thân hình giống như cắt bị đánh bay ra mấy chục thước, đấu khí trong cơ thể cuồn cuộn, một ngụm máu tươi thật lớn cũng phun ra, lúc này hắn mới hiểu được, thanh bào lão giả này cũng là một vị đấu tôn cường giả. - Tiểu thư, chúng ta trở về đi, ngươi cũng không nên chạy loạn. Thanh bào lão giả không có để ý tới Nhiễm Ô Thanh, lập tức cùng Lê Tiểu Dao ly khai đám người. Nhiễm Ô Thanh nhìn thanh bào lão giả rời đi cũng không thể tưởng tượng được, Cuồng sư môn ba chữ đã đem hắn hù dọa, lấy thực lực của hắn ở trước mặt Cuồng sư môn quả thực chính là con kiến cùng voi mà thôi, hắn ngay cả khí lực phản kháng đều là không có, hiện tại bảo tàng đã vào tay Cuồng sư môn, toàn bộ huyền thiên nội lúc đều không có ai dám cướp. Hai ngày sau, tại vô danh sơn mạch, Nhạc Thành mở ra sơn động, sau đó bày ra cấm chế, hắn ở trong đó điều tức, mà đám Thanh bối ma ngưu cũng ở phụ cận hộ pháp. Thanks Leah! I had a blast with the gents page! Glad you liked it! J. Your journal page is too cool, I love the face on your gent! The tag is too pretty, I just sent you a e-mail, if you have a few extra beans I'd love to try growing one. ( I would take mine in a baggy!) Your courtyard looks so comfy, I love the monkey. Thanks for the u-stream, I enjoyed it. Got your email Shari! LOL! Thanks Pal! Hugs to ya! J. ZANDRA!!! LOL! See you this week! So excited to get to meet you in person! Hugs! J.
Fab journal page Jim! Love the 'staches :) Your courtyard is making me sooo jealous! We are still buried under snow here and are expecting more yet this week (ugh)- I'm so ready for spring to actually get here! Cheryl....I can't believe the snow! Amazing! Wishing you some Spring! J. THE COURTYARD LOOKS GREAT! LOVE THE SEED TAG...WHAT A GREAT WAY TO SEND A LITTLE GIFT!!! AND OF COURSE YOUR JOURNAL PAGE IS THE GREATEST!!!! SORRY I MISSED YOUR PLAYING WITH THE DIES....BUT GLAD I GOT A CHANCE TO STOP BY AND SAY HI!!! Hope you are doing well after your fall Kay! Good to see you today! Many hugs to ya my friend! J.
I absolutely LOVE the tag!!! Perfect! Linda...As always...I love you! You rock! OMG!!! LOL...how many of my comments contain...OMG?!?! First...LOVE the gent's page and how you "dressed" the gent...soooo clever. Next...Wanda is going to LOVE the tag...the heck with the bean seeds...LOL. And last...another...OMG...the courtyard looks fabulous! You've done a great job fixing it up....what a nice space to sit out and do a bit of blogging. I got it years ago...I mean at least 10! LOL! It was from a manufacturer call Pacific Rim. Thanks Tons Megs! Mucho Appreciated! Love that tag/gift idea... such a gorgeous tag ! Moustache journal page = so fun !! 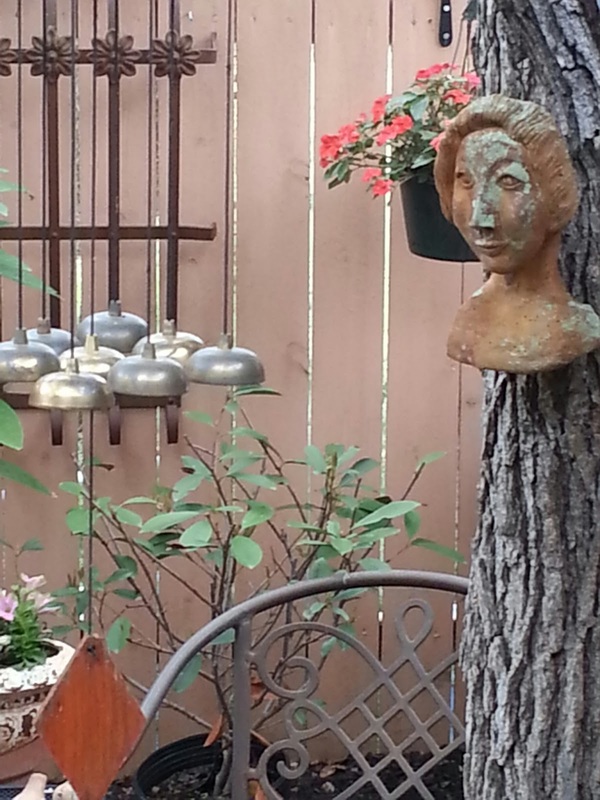 I like the courtyard ; so many creative pieces there! Thanks Rea! I'm so happy you liked them. I had fun figuring them both out...Love that! 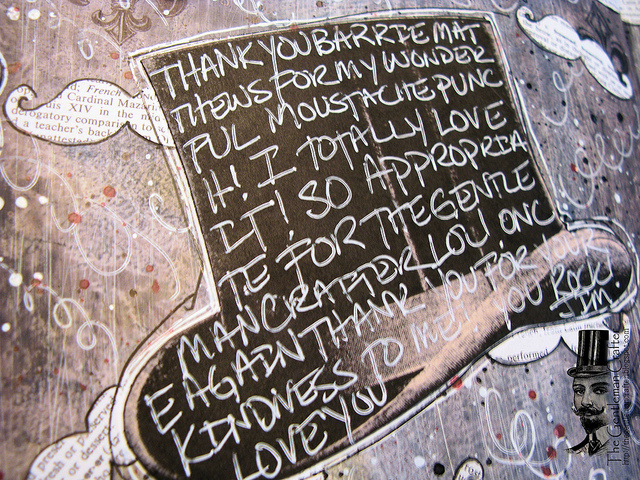 Your moustache journal page is very creative and so you! Wanda will love the tag - it's gorgeous. I love your courtyard too - it looks such a tranquil place to be. The hanging monkey is adorable too (I've always liked monkeys)! Thanks for humouring us and sharing your photos. Good To See you Lynn! Much appreciate that you came over to stream with us! Thank you so much for your kind comments! I wish I had all your friends then maybe I would have a few more things in my stash of stuff. Your journal page and tag are great. You just have a wonderful imagination. Somewhere along the way my got lost. Have a good week. Diane I have been blessed with the best! So kind and generous! Thank you for coming over to look at the tag and page...You rock! Awesome courtyard! And I love the tag and journal pages. Your work is always inspiring! Oh Thanks Kate! I so appreciate it! Love your courtyard! Where did you find that great monkey? Fabulous! Fabulous! Fabulous! I love your journal page and all of the dies! Your seed tag is wonderful and so thoughtful! Now for you courtyard! Gorgeous! I love all of the items that you have all around! You have a very peaceful and relaxing area!!! Ahhh I bet if you took the time for a 10 minute relaxing session out there 3 times a week you would be even more mellow! Not sure how much more mellow you can get!!! Have a fabulous week and then off to Ranger U!!! Woooo Hooo! Wonder what would really happen if I spent 10 minutes out there three times a week...hmmmmmm....might have to try that! LOL! Thanks for coming by Sara! You Rock! Thanks about the well wishes for Ranger U! Pray for SAFE and CALM flights PLEASE! Have an awesome week my friend! Hi Jim, is the clock face a stamp ? Oh, Jim second Sunday that I have missed the ustream. Have been missing spending Sunday mornings with you. Love the journal page and all the stashes. The tag for the seeds is beautiful and a fantastic gift idea. And last but not least is your little courtyard; looks relaxing and all the decorative touches really make it. Thanks so much for sharing. Sharon....I know I missed you! Not the same without you being there..But I will see you in Chico in a couple of weeks! Yahooo! This morning I was driving my 5 Dutch relatives to the airport and last Sunday I was picking them up. Don't they know I have secret Ustreams to attend. Truly enjoyed their visit and the fact that they came all the way to Seattle. Wish I could have borrowed your courtyard last week - very appealing! I'll be fanciful and call it your secret garden.The seed tag is cool. 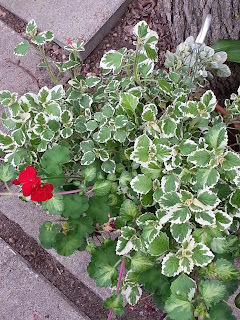 Can you post a photo of the flower when it blooms? I love your mustache page. Barrie is the best. Have a great day tomorrow. 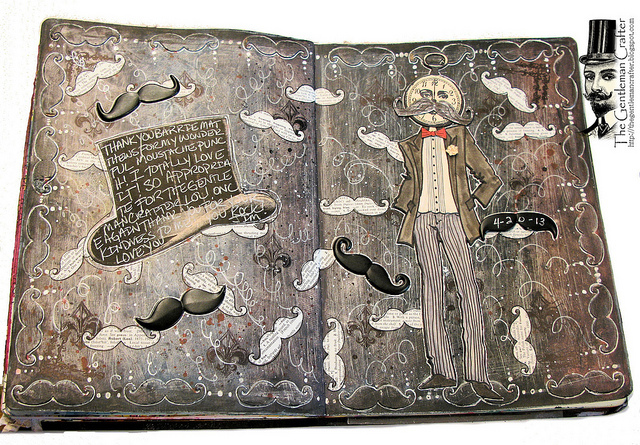 Jim, your 'moustache' journal page is great, love how the journalling all fits in the top hat. As for the seed tag, WOW !!! What a terrific idea. And your courtyard looks amazing - puts my overgrown garden to shame! The journal page is fantastic! Especially love the carnation in his lapel. The tag is very pretty and such a lovely way to send your gift of seeds. I'm sure Wanda will love it. Your courtyard looks very welcoming, restful and quirky. It fits your personality perfectly!!! Thanks for sharing. Love it all, Jim! I usually shy away from bright color but I love that tag and must try something like that! And, your courtyard is a heart's desire for me!! Our yard is so big we just never seem to get it as I'd like it. Your courtyard made me realize that smaller is often better. I am now planning on fencing in an area around my patio (which is under part of the roof of the house which we opened up so that all the beams show and painted it all white to keep it bright). It will make it much easier to get the feeling of being filled with plants and flowers!! So far we have taped off blocks on the diagonal and made the concrete look like tile and I have waited for months to catch some wide-striped, black and white outdoor fabric on a super sale so that I could staple pieces high in the corners to look like drapes. I used tie-backs around them and stapled them to the corner posts to keep them from blowing away! All that has been lacking are the plants. With the furniture out there, containers took up too much space. 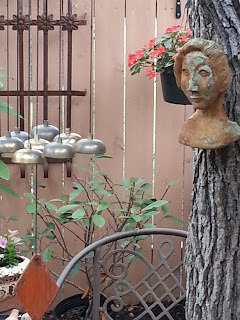 I have to keep things handle-able because I am no spring chick anymore and walling a small area in around the patio would be the perfect answer for me! See... it was important to share pictures with us!! Love the layout you did and your thank you in it for your friend. So nice, and she sounds like a great friend! Love your tag and what a fun way to present seeds. I have never seen these flowers, and hope you share a picture of them in bloom. Your courtyard and decor is so lovely. Jim how cool that you did the UStream and boo on me that I missed it. I was on the red-eye back from Salt Lake yesterday AM but hopefully next time I can make it. Is the show recorded? If so let me know if there's a link. 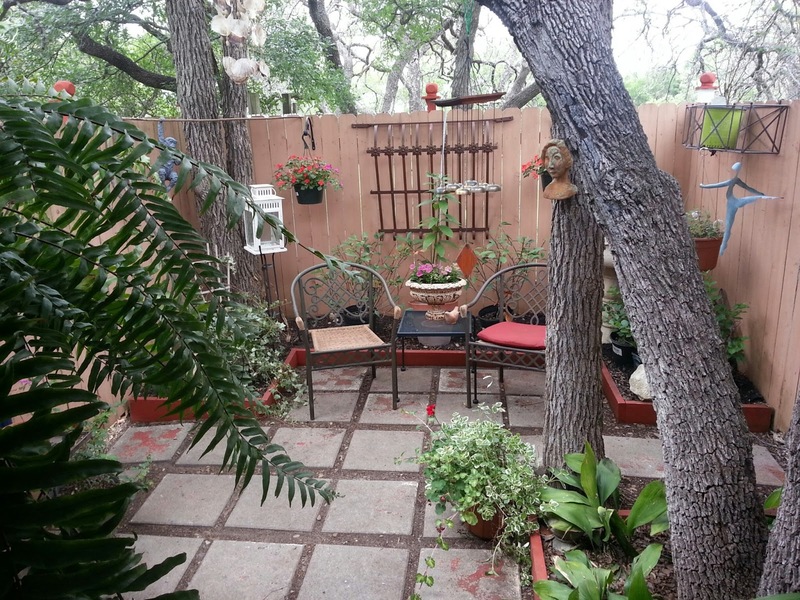 Your patio looks amazing and restful. Great tags too... Can't wait to see what you come up with for the dies! Hugs to you Jim! Hi JIM I had fun at your class, those new dies are going to be fun. That is a very cute mustache punch, Barrie is the best isn't she? Wow wow wow, the tag is wonderful. Thanks so much, now I will have proof that "I knew you when" :). Really nice courtyard, I don't know how much crafting I would get done with your beautiful weather and all those wonderful places to enjoy nature. Love ya, HUGZ. Love that tag! Great journal page! Those flowers on the tag are gorgeous! 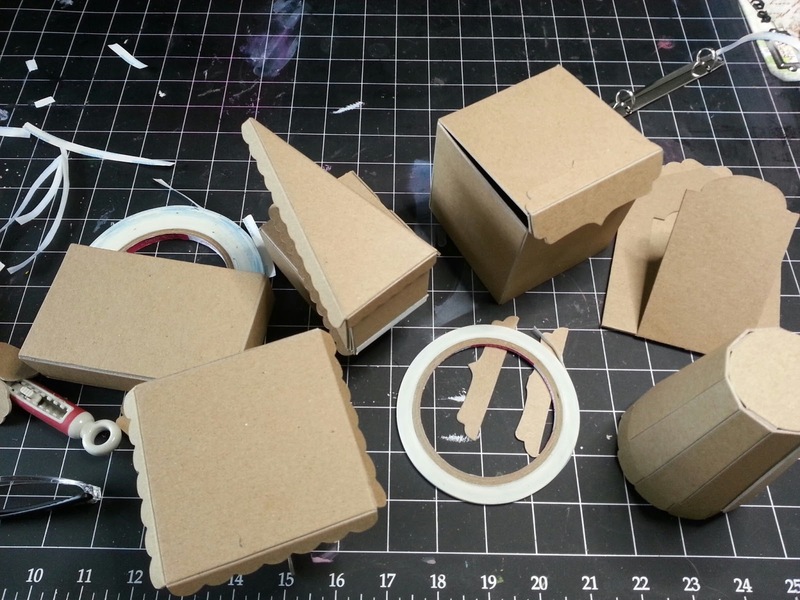 Wondering if you have a video, tutorial on those? Or if you used a die and/or punch? Also the paper line used is beautiful. Did the butterflies come from tje paper line? Sorry so many questions. I just fell in love with your tag there. Blessings! Wow! The courtyard looks special to ME! You did a great job on the courtyard even in the dark!!!!! Looks fabulous. 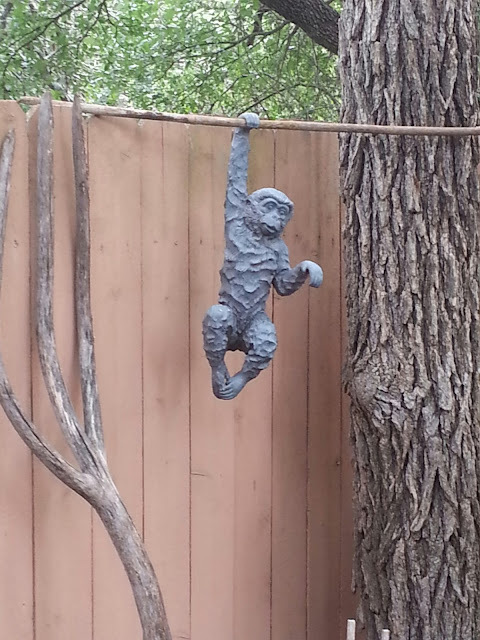 Love all you statues, especially the hanging monkey. To cute! Loved your journal page, I know Barrie is going to agree. And your tag was awesome. What die did you use for your flowers? Not to sound repeatitive, I know lot's are asking the same thing. You rock. What an absolutely beautiful courtyard. It is so very inviting Jim. You did such a great job and in the dark? WOW! You Rock Jim....as always! You never cease to amaze me Mr. Jim!! Both creations are gorgeous but so totally different. I know the variety you create keeps things fresh for you. Absolutely love the gentleman page in your journal! And your friend will enjoy receiving your seed gift tag... such a creative way to give a little gift. And last but no way least... your courtyard is awesome!! Looks so inviting and pleasant. I still say you need put a craft table outside somewhere! Thanks for sharing your endeavors with us all! The Gents Page is just wonderful fun...it made me grin from ear to ear. Whimsy always gets me! The seed tag is just breathaking...delicate, elegant...and so ingenious. Then, the courtyard...of course it is gorgeous. Do you ever sleep? I don't know how you cram it all in, Jim....but I am so glad you do! love all your projects, and was looking at old e mails from you and found the canvas that you made with all the bit and bobs on it, it is really super!!! I recently made two, with my grandsons on each one and I was very pleased with how they turned out. I love this concept and am going to make more of them, thanks for sharing your work!!! Love everything! Your courtyard is adorable. Do you hire out? 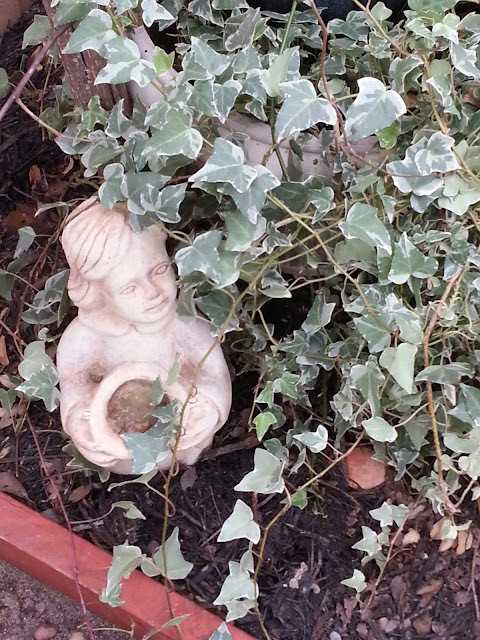 :-) I so want to know how you can have so many little pieces and statutes and such and it NOT look cluttered, but a beautiful and relaxing spot. What's your trick?!?!? again, do you hire out - all i have right now is balcony overlooking a noisy freeway in San Diego, NOTHING serene or peaceful about that.